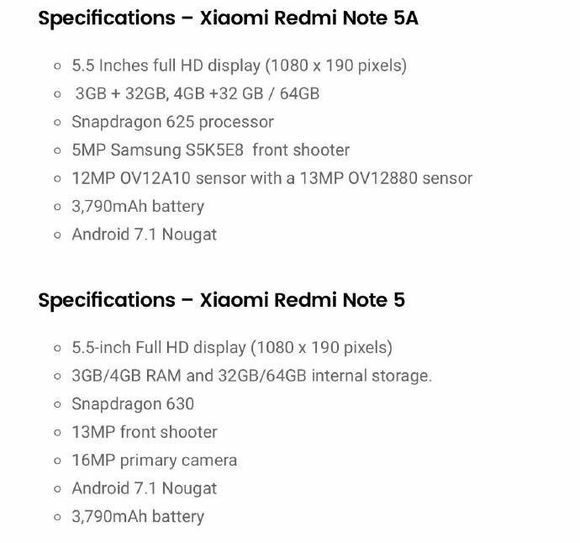 Home News Redmi Note 5 spec-sheet leaked online!!! Redmi Note 5 spec-sheet leaked online!!! There is no doubt left about the huge success of the Xiaomi Redmi " Note " series worldwide, specially in India. The Redmi Note 4 launched last year in China on 25th August and earlier this year, in the month of January, in India is one of the most successful device launches done by Xiaomi in the recent years and it is even claimed to be the India's most selling phone according to Xiaomi sales numbers. With a full metal build, powerful Snapdragon 625 along with 4GB/64GB combination and under a sub $250 price tag, it is definitely a bang for the buck. A post on the Chinese micro-blogging weibo revealed a detailed spec-sheet of the Redmi Note 5. It seems that Xiaomi has decided to launch 2 variants of its Redmi Note series this time naming , Redmi Note 5 and the Redmi Note 5A. According to the posted image, the Redmi Note 5 is said to come with Qualcomm Snapdragon 630, an upgraded version of the last years most popular midrange chipset Snapdragon 625, claiming a 10% bump up in the performance keeping the same battery efficiency. Talking about battery, which has been one of the main strong point of the series, this time Xiaomi is said to choose a slightly smaller battery capacity, a 3790mAh battery which is a shift from the 4100mAh battery used by the company for the last 2 years. Talking about the camera, it seems this time Xiaomi has decided to go with a 16MP rear sensor and 13MP front camera, though there is no word about what sensor is used and the type of auto focus. In terms of the software, the device is said to come with Android 7.1.1 pre-installed with the custom MIUI 9 skin on top of it, which was launched a few weeks ago. There is no news about a change in the screen panel. Now talking about the Redmi Note 5A, it is said to come with Snapdragon 625 processor like the last year's Redmi Note 4. In terms of camera it is " said to " come with a "Dual Camera " setup with a 12MP Omnivision sensor along with a 13MP Omnivision OV12880 sensor. Talking about the front camera it is said to come with 5MP Samsung S5K5E8 sensor. The battery is said to be a same 3790mAh battery. It also comes with MIUI 9 based on 7.1.1 version of android. There is no official launch date released by the company but is expected to release in the last week of August. Pricing is expected to be the same as last year i.e. sub $250 segment. India launch is expected to be in the 1st quarter of 2018 and price is expected around 14,000INR.